The Buffalo Valley Regional Training Center is excited to announce that we are a receipient of a grant from the Sunbury Area Community Foundation, affiliated with the Central Susquehanna Community Foundation with funding awarded through the Sunbury Area Health Fund. 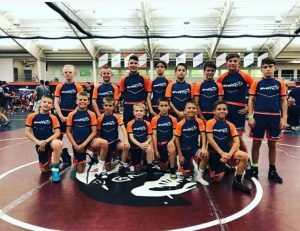 By providing access to free youth wrestling practices coached by an elite and professional coaching staff, the BVRTC has created opportunity for wrestlers of all ages, skill levels, and socioeconomic backgrounds. The additional funding provided by the Sunbury Area Community Foundation will allow the BVRTC to expand its Youth Club to include satellite practice facilities in surrounding communities, where many youth struggle to find safe and reliable transportation to practice locations. The BVRTC’s youth wrestling program uses athletics to address some of the most critical challenges facing young people in our communities today. By participating in the youth wrestling club, these student-athletes create an increased sense of personal responsibility, social belonging, and ultimately develop into better citizens. The Sunbury Area Community Foundation (SACF) was created from the sale of the Sunbury Community Hospital in 2005 as the Sunbury Area Health Foundation to continue to provide for charitable healthcare needs in the Sunbury region. Today the expanded mission of the SACF is helping to meet a multitude of charitable needs for residents of the Sunbury area. For more information visit www.csgiving.org.